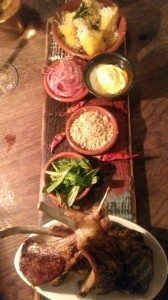 Home Blog Reviews Jamie’s Italian Restaurant Brighton. We all know what we’re getting with the Jamie Oliver brand. The man has made us all more aware of the food we put in our shopping baskets, where that food comes from, what our children eat at school and that having an all-important passion for creating good simple food is what makes it special. 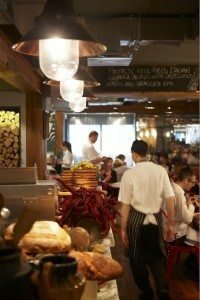 Jamie’s Italian on Black Lion Street is consistent with this ethos. 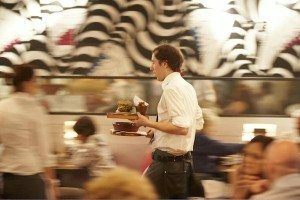 The restaurant is open and honest, it’s not fussy or clinical, the bustling noise of people creating dishes and other people eating them in the same room, is comfortable and reassuring. It’s a warm, intimate and laid back space, a lot of bare wood and bare metal, not intimidating or pretentious. It’s designed to make customers feel instantly comfortable and that what they are about to eat is created with passion without any fuss. The staff are young and attractive, not an uncool haircut among them and all very quick to please, and the food is, predictably; good, colourful, tasty and overwhelmingly simple. It seemed to me to be all about the marriage of natural ingredients..
..whatever grows together or is in season at the same time goes together on the plate. And this inevitably works. Mother nature knows what she’s doing after all. I was asked to go along and try a few of their favourites, so I took my mum last Wednesday and we loved it. It’s authentic Italian rustic style non-fussy dishes that come out hot, fresh and delicious. Not to mention beautiful. We started with the Crispy Arancini, Crispy Squid with garlic mayo, and a platter of cheeses and cured meats. You can tell already we weren’t going to leave here hungry… The Squid was coated in a crisp and perfectly seasoned crumb, it was fresh and not in the slightest bit chewy, more firm and yielding. A tasty savoury morsel which was balanced excellently by the sweet spectacular excellence I found in the spicy arrabiatta sauce, which accompanied the arancini. The arancini themselves were marvellous; crisp and crunchy outside, with the inside firm and creamy. Stuffed with mozzarella and sweet red chilli, they oozed gooey deliciousness whilst the most heavenly part of it for me was the sauce. Delicate, subtle warm heat from the chillies..
..the tomatoes were sweet beautiful perfection finished simply with fresh baby basil. A simple, elegant and magnificent starter if ever I’ve had one. And I have. The sharing platter of meats and cheese was a combination of textures and tastes, smooth, rich, powerful, soft, crunchy, tangy and sweet. 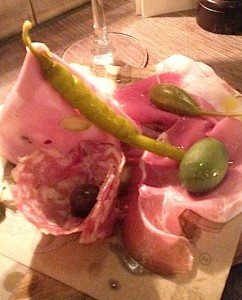 There was fennel salami, pistachio mortadella (gorgeous), prosciutto and massive green olives, caper berries, green chillies, buffalo mozzarella with mint, pecorino (yum) served with a squidge of chilli jam. Then to compliment all this we had a plethora of different Italian breads – crispy thin ‘music bread’ which was absolutely made to be eaten with pecorino, rosemary focaccia, sourdough and ciabatta. I must comment here, however, on the out and out best bit of this platter, which was the crunchy salad. I will stop here to explain, I’m not a salad fan. Regular visitors to RB review pages will know this already; if I order a meat platter, I don’t really want any salad thank you. However, this salad was different. It consisted of shaved carrot, beets and kohlrabi (a hideously ugly member of the cabbagey/turnip family) dressed in lemon and mint. A heap of shiny cool crunchy veg shavings, fresh and sunshiny and summer daysey. If all salads came like that I wouldn’t have this irrational hatred of them. The next course, we were told, would be an ‘Intimate’ pasta course. We sat up and looked ravenous. Then unfortunately our handsome waiter corrected himself, it was to be an intermediate pasta course after all. Freudian slip natch. 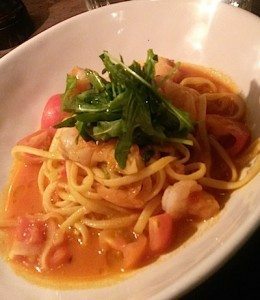 We shared the Prawn Linguine with heaps of garlic, shaved fennel, tomatoes, chilli and rocket, which was a little garlic heavy, but the pasta was undeniably fresh and firm. The prawns were huge and plentiful and the fennel a real joy. The subtle flavour of the fennel wrapped the garlic prawns up in a nice little blanket of lusciousness. It really was a good balance of flavours. 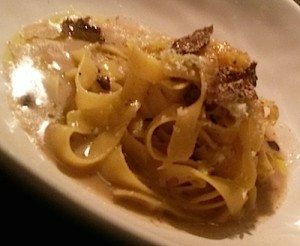 Our favourite of the two pasta dishes was the Truffle Tagliatelle. Fresh foraged black truffle (freshly foraged in Italy and sent straight over to Black Lion Street in double quick time it turned out) with butter, parmesan and nutmeg. Simply mentioning parmesan butter and nutmeg in the same sentence will no doubt make you think of a warm and creamy pudding, it does me anyway, add the appearance of the rich and mouth-wateringly divine truffle and you’ve got yourself an intimate pasta experience. Once we had managed to regain composure, aided by the stunning honey and peachy spiced notes of the wine, a Fiano Di Avellino, we were ready to sample the delights of the main course. We shared the British Lamb Lollipops, which are described as being ‘grilled under a brick’, which sounds to me like a brutal method of making people talk. They came with a variety of little pots of tasty goodness to dip them into. There was pickled tarragon and mint, red onion salad, crushed toasted nuts, and a chilli, yoghurt and lemon dressing. The lamb was cooked to perfection, moist and tender with crunchy tasty fat on the edge and pink and juicy inside. Holding the bone and dipping them into the sides was a rather boarish way of eating which made it all the more fun. You can’t try and be civilised when dipping lamp bones into crushed nuts and chilli yoghurt. You just have to lick your fingers and enjoy it, and that we did. 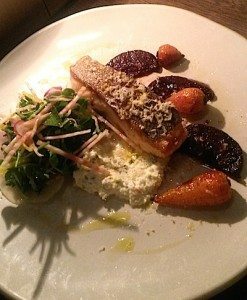 The second main course was the Baked Shetland Salmon with lemony ricotta, balsamic roasted baby veg and crunchy salad. The salmon was delicate, moist and firm, the skin nicely crisp and tasted of the sea. Perfect. The rest of the dish won it again for us – the pairings and flavours of all the fresh vegetables was magnificent. The baby beetroot were heavenly, the minty crisp salad was fresh and light. You could almost taste the earth that it had been plucked from it was so fresh. If I were to award stars, the veg and salad accompaniments of every dish at Jamie’s would get 5 stars. They were without exception, all outstanding. Not over dressed or over fussy, we were tasting them at their absolute best and served exactly how they should be. With as little fuss and as much love as is possible. We had a few polenta chips with rosemary salt and parmesan to go with the mains, and these were incredibly good. Seriously crunchy, seriously well seasoned and just great. The chips were fluffy on the inside and would go with just about anything you threw at them, which of course, we did. There was a Chocolate and Espresso Profiterole, with bitter hot chocolate sauce and orange zest – divine. There was the Autumn Rippled Pavlova with zesty cream and limoncello soaked fruits and smashed hazelnut praline – chewy, fruity tangy heaven. Tiramisu with orange mascarpone and chocolate – delish. The favourite of them all though was the Epic Fudge Brownie, which was indeed EPIC. Served warm with amaretto ice cream and caramelised amaretti popcorn. To quote my mum it was ‘the best popcorn I’ve ever tasted’. She added, which made me laugh so I felt the need to include it here, ‘I don’t normally like brownies. Usually they’re dry as a bone and been hanging around for hours’. This one was warm and soft and gooey and moist. Absolutely miraculous. I’d come back just for the brownie. If I was completely mad – of course I wouldn’t, I’d come back for the works! We knew it would be good – I’ve always had a soft spot for Mr Oliver, with his exuberance and giggly Essex boy passion for food, his recipes are simple and fun. Natural and fresh ingredients thrown together from a great height with a lot of love and no fuss. This is no exception and truly a different kind of Italian restaurant. Very Brighton, and bloody good.